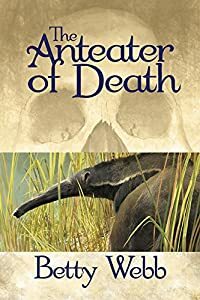 The Anteater of Death by Betty Webb: Synopsis and Online Purchase Options. Synopsis (from the publisher): But if Lucy, the pregnant Giant Anteater from Belize, didn't kill the man found dead in her enclosure, who did? California zookeeper Teddy Bentley must find the real murderer before her furry friend is shipped off to another zoo in disgrace. Then another human bites the dust, the monkeys riot, and the wolves go nuts. Things get worse when the snooty folks at Gunn Landing Harbor attempt to evict Teddy from the Merilee, her beloved houseboat. That's just the beginning. Her father, on the lam from the Feds for embezzling millions, gets targeted by a local gangster; and Caro, Teddy's socialite mother, a former beauty queen who loathes Teddy's dangerous job, starts introducing her to "eligible bachelors." But Teddy has already given her heart to Sheriff Joe Rejas, a migrant worker's son. Caro is not pleased. Zoo life, animal lore, and the leaky ups and downs of Central Coast California houseboat living create a thrilling backdrop for murder.